The United States Congress designated the Lee Metcalf Wilderness (map) in 1983 and it now has a total of 242,068 acres. All of this wilderness is located in Montana and is managed by the Bureau of Land Management and the Forest Service. The Lee Metcalf Wilderness consists of four separate units distributed across the Madison Range in southwest Montana. The Bear Trap Canyon unit is administered by the Bureau of Land Management and is the smallest of the four units. The Spanish Peaks, Taylor Hilgard, and Monument Mountain units are administered by the Forest Service and are located in the Gallatin and Beaverhead-Deerlodge National Forests. 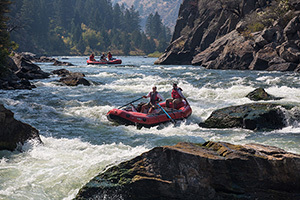 The Lee Metcalf includes a variety of physical and biological communities ranging from the low-elevation Bear Trap Canyon on the Madison River (about 4,500 feet) to alpine ridges and peaks above 11,000 feet. There are no active glaciers in the Lee Metcalf Wilderness, although the high cirque basins and U-shaped drainages provide evidence of Pleistocene glaciation. The Wilderness receives variable precipitation, from an average of 11 inches in the Bear Trap to over 60 inches in the Madison Range. At their most extreme, winter temperatures can drop as low as -30 degrees F and climb as high as 100 degrees in the summer, but seldom do. Temperatures are more moderate in the spring and fall. Treeline is generally around 9,000 to 10,000 feet. Between treeline and the high rocky peaks, alpine and sub-alpine vegetation is dominant. Wildlife is abundant throughout the Wilderness and includes mountain goats, bighorn sheep, black and grizzly bears, moose, elk, cougars, and wolves. Cutthroat, rainbow, and brook trout can be found in the lakes and streams. In total, there are 300 miles of trail and 28 trailheads that provide access to the Lee Metcalf Wilderness. Planning to Visit the Lee Metcalf Wilderness? How to follow the seven standard Leave No Trace principles differs in different parts of the country (desert vs. Rocky Mountains). Click on any of the principles listed below to learn more about how they apply in the Lee Metcalf Wilderness.